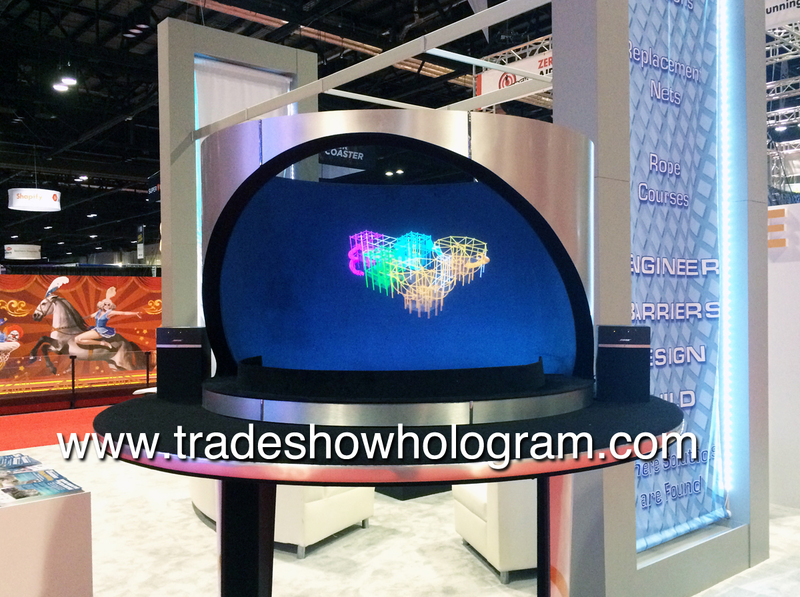 A new interactive holographic projection display system was featured at the 2016 AAEP trade show in Orlando FL. Mobius Imaging used the holographic projection display to highlight special features of the new VERSO CT Scanner for the Equine market. 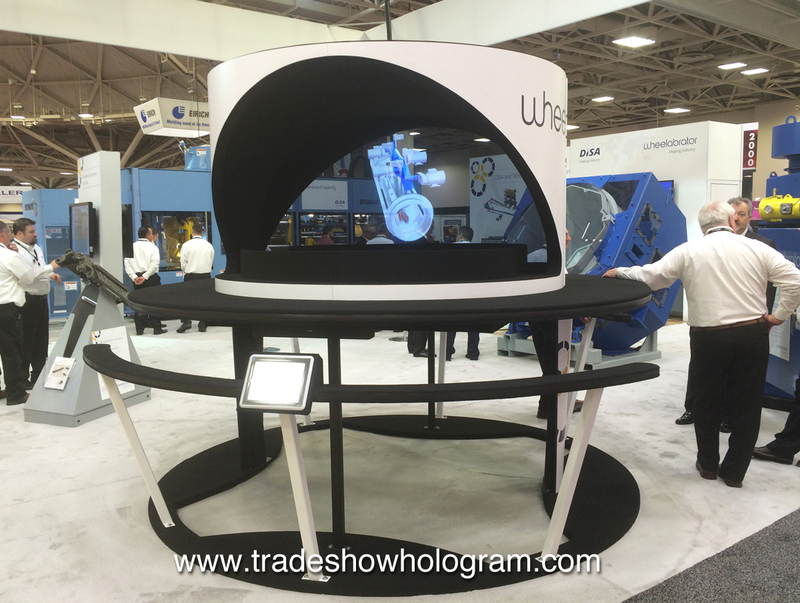 The display featured Trade Show Holograms newest advancement, Ultra Bright Technology which allows the projections to remain crisp and clear so they can be seen from great distances even in bright trade show environments. Multiple holographic programs can be called up on demand with a simple touch of the interactive touch screen on the display. The new display features dual projectors allowing for separate presentations to be viewed from either side at the same time. No special glasses are required to see the stunning 3D visual effect floating in mid air. Trade Show Holograms featured their new interactive dual sided hologram projectors at the SuperCorr Expo in Orlando Florida. The new displays feature Ultra Bright Technology to ensure bright visible 3D holographic projection even in todays bright trade show environments. These displays feature interactive touch screens on each side to allow on demand playback on any available hologram presentation. The dual projectors are aligned to allow independent playback without interfering with the presentation playing on the opposing side. Viewers see a 3D holographic projection floating in mid air. 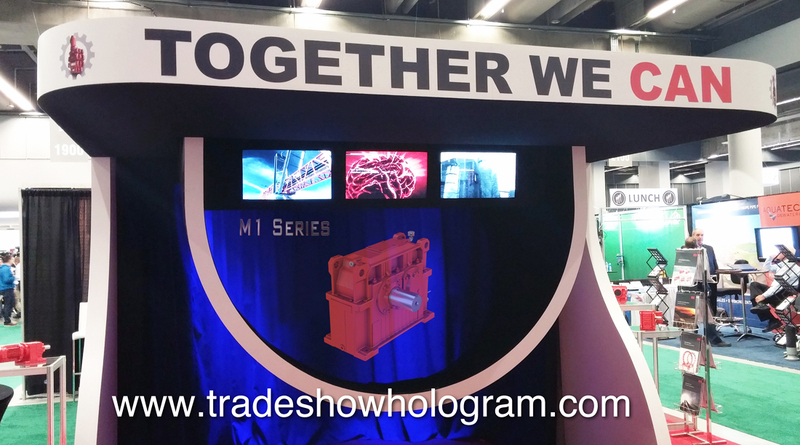 A new series of 3D hologram projector was debuted at the 2015 CIM trade show in Montreal Canada. SEW Canada used the amazing new display to present its products and features to attendees at the CIM. The presentation included an introduction by Fiona a virtual presenter who welcomed visitors to the show. The new design features hologram projections sizes of 3 ft high and 5 ft wide, enabling large hologram images floating in mid air. 3 standard video monitors are also included allowing exhibitors to present more detailed video in a 2D format. 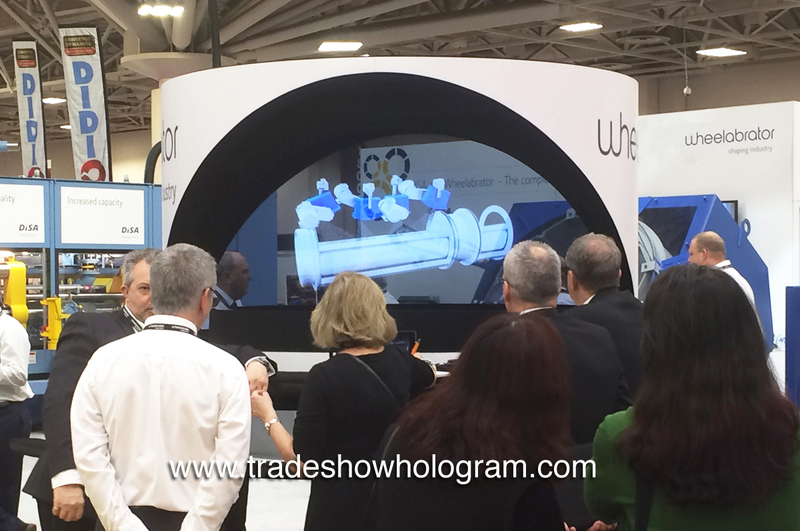 Trade Show Holograms has been the industry leader in holographic displays for trade shows across the USA and Canada since 2006. 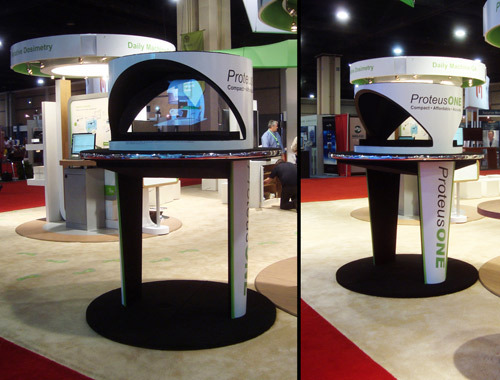 Displays are rented or for sale to trade show exhibitors who are interested in adding attention getting special effects to their booth. Keynote Presentation features large 3D hologram projector. A large 3d hologram projector was utilized to help keynote speaker Wade Barnes present his presentation called BIG DATA at Farm Tech 2015. The presentation focused on the future of the business of agriculture and how the use of Big Data can be implemented in it. 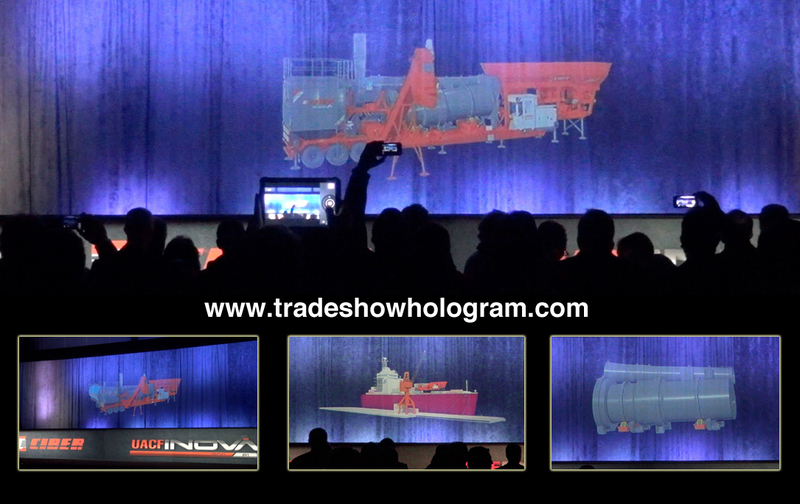 Trade Show Holograms, a company that specializes in large and small 3D holographic effects across North America provided the 3D projection system to accompany the keynote speech. The projected images were up to 8 ft tall and 15 ft wide and appeared to float in mid air beside the presenter. Virtual Holographic Presenter FIONA opened the keynote with a greeting. Below is a video featuring highlights from the powerpoint presentation. 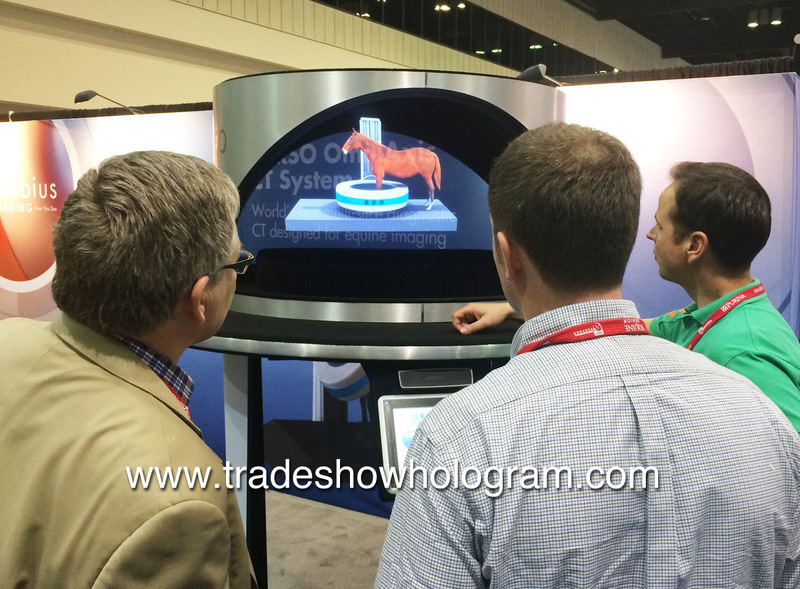 The International Cheese Technology Expo featured the debut of Trade Show Holograms newest 3D Hologram Projector. With holographic images up to 3 ft tall and 5 ft wide it proved to be a huge hit. The presentation featured a holographic demonstration of various lines of cheese processing equipment. This latest design offers an additional 3 video monitors in the front with the ability to play either video or photo slideshows for more detailed information. Video of the presentation is found below. Earlier this month visitors to the Perimeter Institutes annual BrainSTEM festival were greeted by Victor. Victor is a life sized 3D holographic virtual spokesperson, greeter and presenter who is also a robot. Victor is the male counterpart to Fiona, the original holographic robot in a series from Trade Show Holograms. The company developed the ability to project life sized holograms when the demand for virtual spokes persons, greeters and presenters boomed due to the popularity of the Tupac Hologram in recent years. Victor informed guests and visitors or the festivals new interaction via Twitter. The same effect can be achieved with any corporate speaker, CEO or presenter. The 3D displays are available for sale and rent across the USA and Canada. Life Sized 3D Holographic Greeter and Presenter welcomes guests to BrainSTEM Festival. 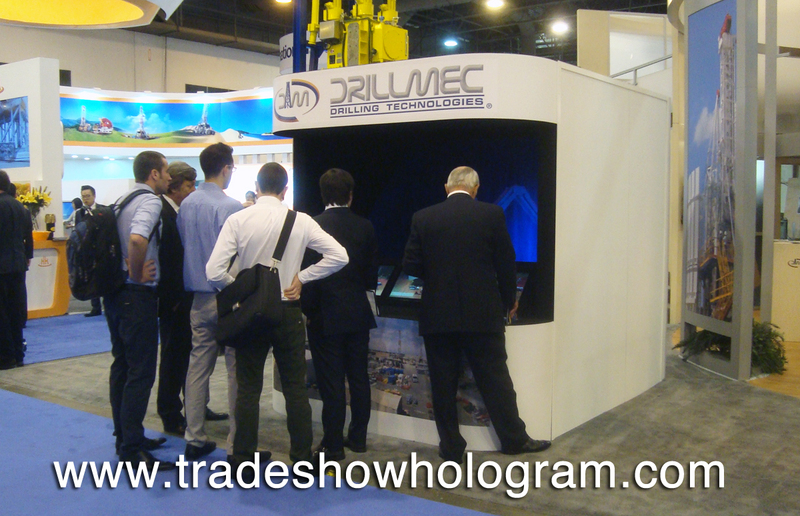 3D Hologram Exhibit attracts attention to trade show booth in the USA. 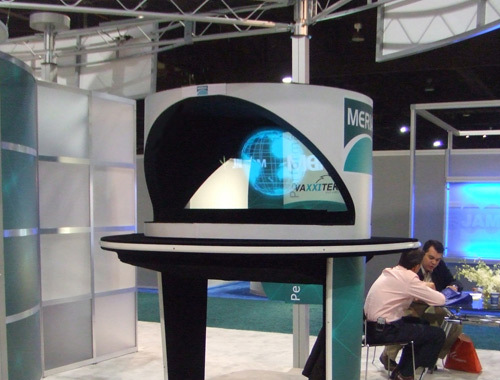 A trade show booth at the recent IAAO 2013 featured a holographic 3D projector. 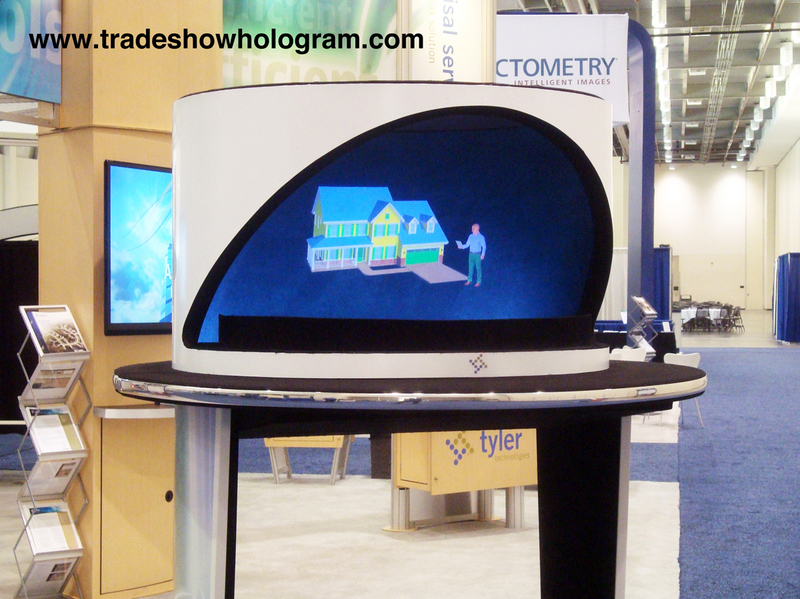 Trade Show Holograms created a 3D presentation highlighting Tyler Technologies new software. The 3D Hologram Projector is designed to stand out in todays competitive trade show environment and attract attention to the booth it is exhibited in. These amazing visual displays included colour, full motion and audio effects and are available for both rental and purchase across both the USA and Canada. Trade Show Holograms has continued to expand its line of 3d Holographic Presentations with its life sized holographic virtual presenters and giant large scale holograms. The company had been creating and developing holographic displays for trade shows and conferences for over 7 years but had recently developed larger scale hologram projectors capable of projecting images up to 8 ft tall and 15 ft wide. 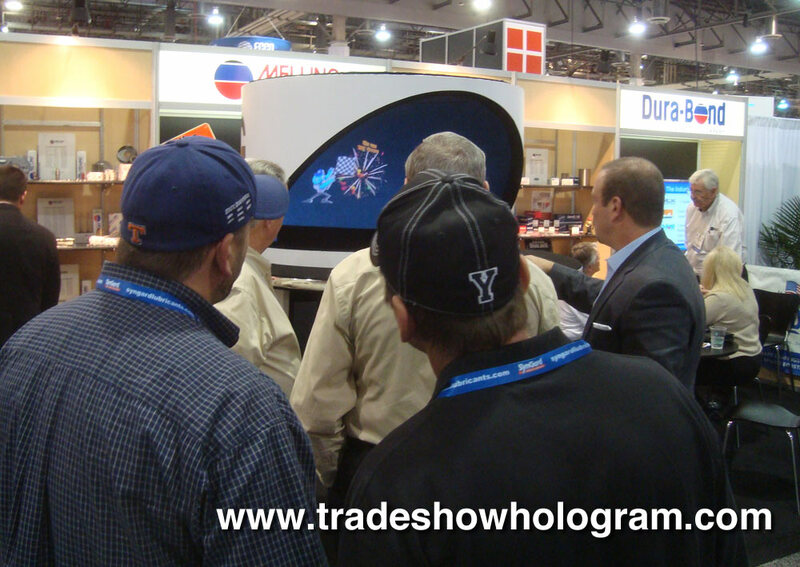 Holograms are an exciting way to capture an audiences attention at trade shows or conferences. A Giant 3D Hologram Projection is exhibited on stage during a presentation. Giant 20 ft wide Hologram Projector presented to live audience. 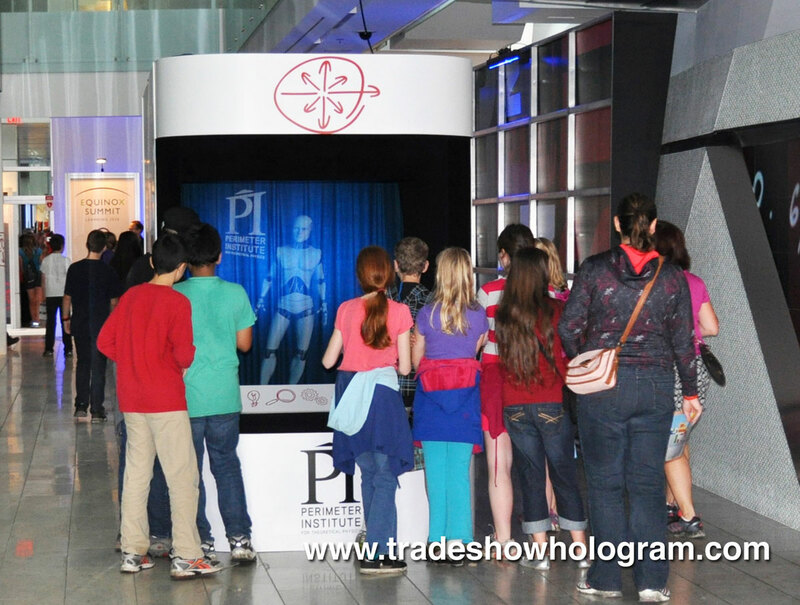 Trade Show Holograms is a hologram projector rental and sales company which provides holographic projections to trade show exhibitors and event planners across North America. They recently displayed a giant 3D hologram projector which created a holographic projection that was up to 20 ft wide. It floated in mid air in an airspace of 30 feet wide. The large scale holographic presentation was shown to a live audience in a theatre setting. It highlighted features of one of the companies products. The display was designed by corporate illusion designer Timothy Drake. Special thanks go out to Robyn McCamy of Maple Ridge Event Solutions in Nashville TN, who provided event planning and supply services to make the project a success. 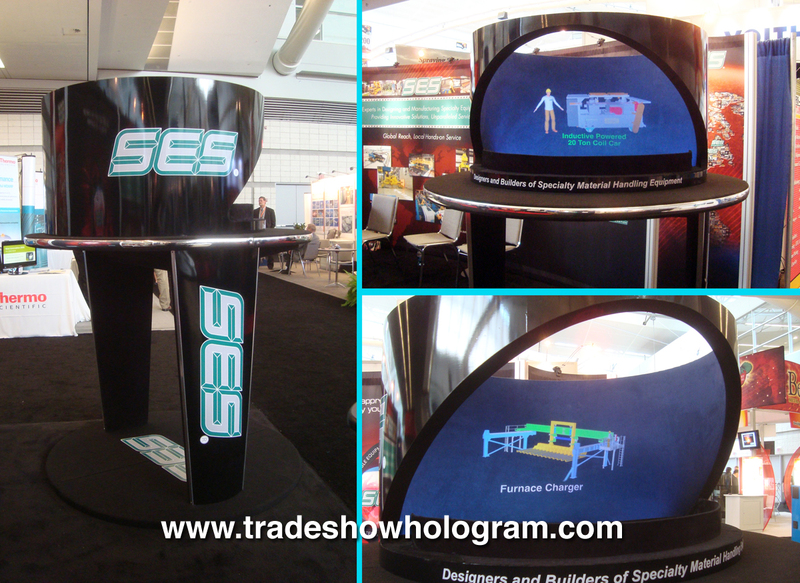 3D Holographic Projectors are an exciting way to attract visitor attention to a booth at a trade show. 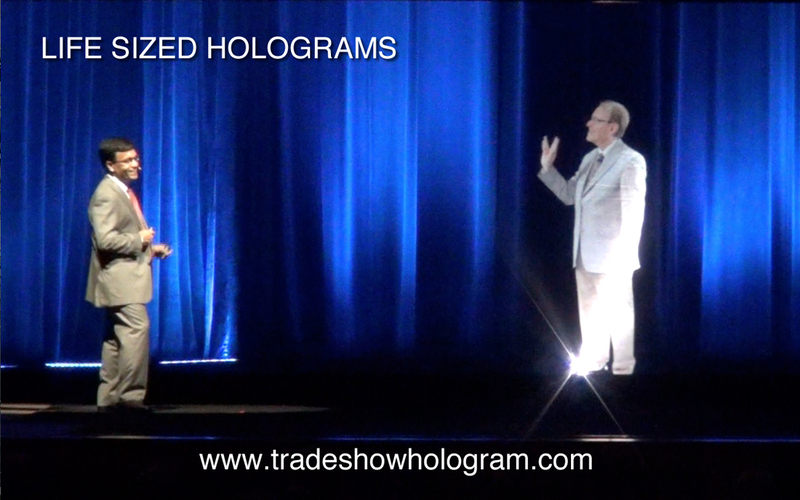 Corporate Illusionist Timothy Drake formed Trade Show Holograms to supply hologram projector rental and sales to the trade show market in the United States and Canada. The hologram projectors project a 3D optical illusion of a hologram floating in mid air. The holograms can feature full color options and sound effects. 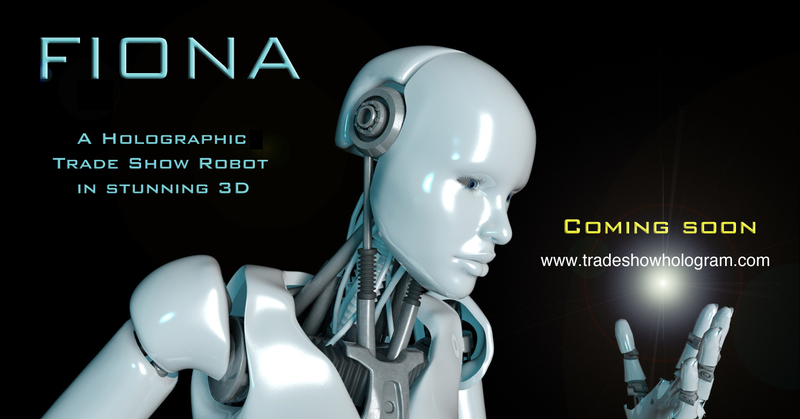 Trade Show Exhibitors find that the amazing 3D presentation draws curious visitors to their trade show booth. 3D Hologram projectors display fully animated holographic images and video that float in mid air. Trade Show Holograms is a company created by Corporate Illusionist Timothy Drake who designs special effects and illusions for the corporate market including trade shows. The hologram projectors project holographic images that range from 10 inches high to life size holograms. 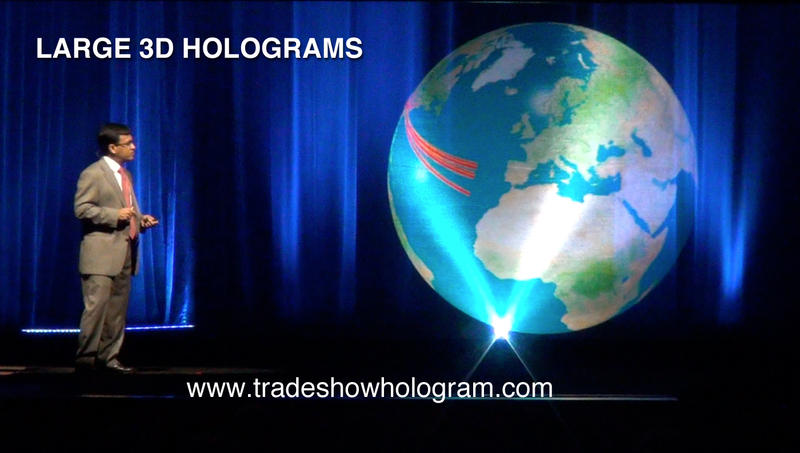 Trade Show Holograms is company created by corporate illusionist Timothy Drake in 2007. The company creates, rents and sells 3D hologram projectors for the trade show market in the USA and Canada. The hologram projector displays a floating 3D image of any product, corporate logo or presentation.